The thing about giving grace is that something bad has to happen for you to even consider it. I’m not even going to lie to you. I have been a total mess lately. Just when I thought I was getting myself together, I totally dropped the ball on a lot of things… housework, exercising, eating right, staying on a budget… Like I said, I am a mess. I have no idea how I am going to recover. Often times, I beat myself up about things, saying “This house is a mess,” or “Why do I keep forgetting to bring this blanket to daycare,” or “Why did I buy that Fenty foundation knowing I have plenty of makeup already?” I could go on and on. And then my son peed in the bed. For months, I bragged to my family and friends that my then 3-year-old son was completely potty trained. No accidents! Then one night, he woke up and called for me to come into his room, which he usually does when he wants me to accompany him to the bathroom… you know, just in case there are any monsters to fight off. Well this time when I got to his room, he looked at me with those beautiful brown eyes filled with tears and said, “Mommy, I had an accident.” I wasn’t mad at him or disappointed at all. Instead, I comforted my son, telling him that it was okay and that we all make mistakes. I explained to him that it was just an accident and that he would do better tomorrow. I comforted my child when he made a mistake. I knew he could do better, but I showed him grace anyway. Something I have never been able to give myself. Grace is defined as the exercise of love, kindness, mercy, and favor. It is the undeserved kindness or forgiveness of God. If God can forgive us for all of our sins, why can’t we forgive ourselves for something as small as skipping washing the dishes one night to go to bed early? However, all too often that is not something we grant ourselves as mothers, let alone as women. We will easily show others a little grace for their wrongdoings but will beat ourselves up for the tiniest thing. Well, I say enough is enough. Let’s show a little grace to ourselves. We are only human and we make mistakes too. It’s time we forgive ourselves and show some mercy. Then, tomorrow we can dust ourselves off, adjust our crowns, and pick back up where we left off. I’m going to start by giving myself grace when I’m too tired to finish a little housework. Those dishes will be fine until the morning. 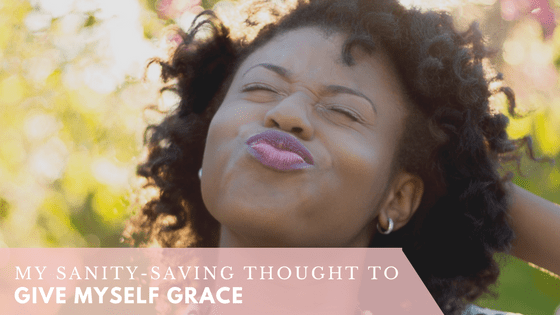 What are some areas in your life that you need to start giving yourself grace for?